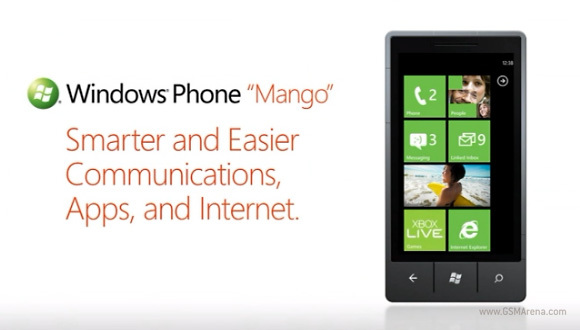 Windows Phone 7 Mango was released to manufacturers about three weeks ago and it seems that testing is going well. Sources now claim that the first major update for Microsoft's new mobile OS is going to become publicly available on 1 September. The first big update for WP7 was NoDo and its roll out wasn’t as smooth as Microsoft would have liked, despite releasing a very minor update first that was supposed to set the ground for NoDo. Hopefully, this time everyone has done their job as the rumored 1 September deadline is approaching fast. It's a well picked time for an update, just in time for IFA (2-7 September), which will have major manufacturers gathered and showing their new devices. Nokia should also be releasing their first and most likely only for this year Windows Phone 7 handset in October. The phone (codenamed Sea Ray) should launch with Mango, but there's talk Nokia might be getting a special version aimed at lower-end WP7 called Tango. The Mango update brings all sorts of important functionality (yay, multitasking!) and will make WP7 much more competitive against Android and iOS. Plus, with second generation devices coming from major makers, hardware should take a major leap forward too. Are you interested? Is it 1st September yet or it is supposed to be 1st September 2012? Waiting for marketplace in India too. Tired of marketplace not available in your country.